Next on to Dresden -- a more beautiful city is hard to imagine. I might be killed for saying this, but I found the relatively stark, bare but gigantic arches of the Kreuzkirche (Holy Cross Church) more appealing than what we saw in the Frauenkirche -- or maybe it was just a reaction to the masses of tourists streaming in and out of the Frauenkirche. In any case, it had been nicely restored and is certainly very impressive. There was a real treat waiting for me at the famous Green Vault -- in the form of 'The throne of the Great Moghul Aurangzeb'. It is one of the most exquisite works of art I have ever seen. We also went to the Semperoper -- and both Wagner and the opulence of our surroundings made that evening unforgettable. Another tip, the Pension am Grosser Garten has the most beautifully laid out breakfast buffet you can ever imagine -- a real work of art; and speaking of art, it also has an amazing collection of paintings that you would immediately recognise -- Monet, Picasso, van Gogh, Chagall -- but they were not quite the real thing. They were also not reproductions, nor were they copies, we were told that the owner of the guest house sent him copies and commissioned a Thai painter to just draw them all anew -- with a refreshing sameness woven into the difference. It looked as if its huge facade was just beginning to melt. On going closer we realised what it was -- one of the Hundertwasser's last building projects, completed after his death only in 2005 -- called mysteriously the Green Citadel (beacuse of the green grass that is supposed to cover the roof, I found out). 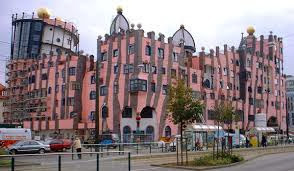 We spent more than an hour, happily inspecting some details -- no pillars were the same, no two windows had the same shape and there was not a single line that has been drawn with a ruler...true to Hundertwasser's style. We were planning to go to see the Dom but then told ourselves that we already had more than a huge treat and that we should drive on. Our final stops Bremen and Hamburg -- we knew Bremen from before but Hamburg was completely new for me, but we had only a couple of hours to walk around. I had heard of the Reeperbahn but had no time to go there -- instead we went to see the magnificent Rathaus in the heart of the city where preparations were on for the Christmas markets that would be starting all over Germany soon. We then walked around the lovely Binnenalster lake with splendid rows of stately white buildings -- proof of the immense wealth of this port city in times gone by. Bremen and Hamburg have historically always been in competition with each other, they are also the two cities in Germany (besides the city of Berlin) which are states in their own right, having been independent port cities in earlier times. It did look as if Hamburg was a lot more grander (and also much larger) than Bremen, at least in terms of what we saw, but of course, Bremen along the river Weser with its absolutely unique Rathaus has its own special attraction.